Key Difference: BMI stands for body mass index. It is a measure that indicates a ratio based on height and weight. Body Fat Percentage is another body measurement technique. It provides the ration of fat to body mass. It indicates how much fat composes the body. People’s health is declining. This is mainly due to the increase of a sedentary lifestyle, i.e. where people sit in an office all day, as opposed to the olden days where people had to do got and work the fields or forage for food. A sedentary lifestyle is not exactly a bad thing, but certain changes must be made to facilitate living a healthy lifestyle, such as exercising and eating healthy. There are many ways that one can use to figure out whether they are considered as healthy or as unhealthy, overweight or obese. Two of these ways are BMI and Body Fat Percentage. BMI stands for body mass index. It is a measure that indicates a ratio based on height and weight. It was developed between 1830 and 1850 by Adolphe Quetelet and is defined as ‘the individual's body mass divided by the square of their height’. As its definition states, BMI is calculated as mass(kg)/height(m)2. Alternately it can also be calculated as (mass(lb)/height(in)2)x703. BMI is also often calculated on the basis of a table or chart, which usually has different BMI categories segregated on it. Body Fat Percentage is another body measurement technique. It provides the ration of fat to body mass. It indicates how much fat composes the body. It is calculated by dividing the total mass of fat by total body mass. While lower body fat percentages are ideal, one must keep in mind that a certain amount of fat is required by the body to function properly. According to the American Council on Exercise, men require 3% to 5% of fat, while women require 8% to 12%. Women generally require more fat than men due to the demands of childbearing and other hormonal functions. 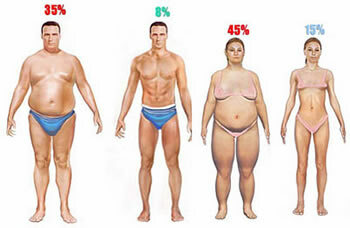 The average measurement of fat in men is 18% to 24%, while in women it is 25% to 31%. The main difference between BMI and Body Fat Percentage is that Body Fat is a measure of fitness level. It is the only health measurement that directly calculates a person's relative body composition irrespective to height or weight. 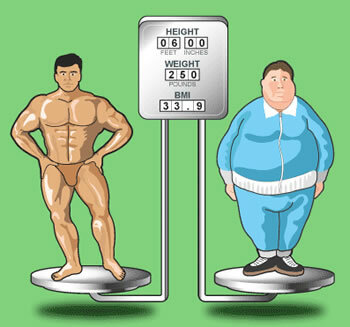 BMI, on the other hand, provides a fat comparison directly based on height or weight. BMI is the most commonly used body measurement. However, it is largely criticized as being inaccurate. The BMI increases as body fat increases, but it does not take into account the differences in body composition, such as greater muscle mass or larger bones. Hence it ends up giving the same BMI measurement for an athlete and an obese person who have different weights and heights, even though one is fit and the other is not. The individual's body mass divided by the square of their height. Via formula, or though a table or chart. Measurement with calipers, through the use of bioelectrical impedance analysis, or DEXA scan which requires an X-ray. Uses the same method and formula for any gender. Women usually have more fat than men. This is due to the demands of childbearing and other hormonal functions.